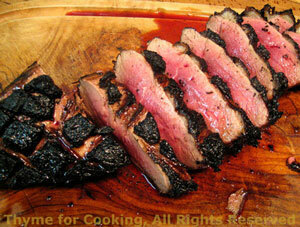 Grilled Marinated Duck Breast, Magret de Canard, Thyme for Cooking recipes. It has about 1/3 inch of fat on one side which delights the pyromaniac in mon mari - cooking it on the barbecue sends flames shooting up about 3 feet. The fat mostly burns off so there is rarely a need to trim it. This has absolutely no resemblance to wild ducks, Peking ducks, Long Island ducks or any other duck. I do not know if you can get it wherever it is that you live. It would likely come prepackaged. If you can't get it, substitute any regular beef steak - or even venison! Can be fried in a skillet - but it makes a mess. Cross-hatch fat on duck (you know - make little squares) cutting through skin and fat just to meat of breast. Crush juniper berries and peppercorns. When ready, cook duck breast on barbecue starting fat side down for 5 minutes. Make certain barbecue is away from dried weeds, dried wood and low trees. With long tongs turn breast over (mind your eyebrows) and continue cooking another 3 - 5 minutes. If there is any fat left on fat side put fat side down for a minute to burn off. Cook 2 minutes longer each side for medium. For well-done ...don't do that. Remove from heat and take a peak (stick knife in center and make a cut). If done to your liking let rest a minute. If not put back on barbecue for 2 minutes. (I know the purist would be appalled but one has to learn somehow.) See techniques for more help. When ready, cut in slices about 1/4" (.65cm) thick and serve.